This lovely Barracuda was not supposed to happen already, but as you probably know, cars come up for sale when THEY want to, and not when YOU want them to.. In my eyes, this particular fish seem to be in great condition, but as all old cars, it has issues. I always try to give my new cars the impression, that they are safe with me, so I already have a shopping list of parts. I think it may have serious electrical issues, so I will start off with some fresh wires, under the dash, and a fresh engine harness too. One thing that REALLY needs replacing, is the front seat covers, but I am beginning to doubt that I will be able to find the right ones. To my horror, I dont see my Barracudas fabric on Legendary's website, OR in the "downloadable catalog". However, the website is near impossible to navigate, with images of only selections. It seems that it's not gettin any better, OR faster.. actually it seems a bit worse, than last December!? It's so slow, that often, I get distracted by work, or my kids. while waiting for pages to load. Because of the low resolution pictures I found first time I looked, I assumed that the fabric I needed, was the one that Legendary referred to as "houndsteeth", but I Googled it and found higher resolution pic's, and found that houndsteeth was a fabric VERY different from mine, (which is some sort of "velour cut in a pattern"), and I'd REALLY like to do the right thing, and bring this interior back to it's original glory! So, I hope and pray, that some of you "Cuda experts" could verify, if the "velour'ish insert fabric" in the pictures are original, or not.. and if you know anything about Legendary, or anyone else makes repro covers in this particular fabric / style! 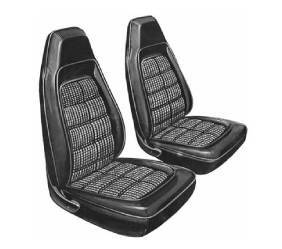 I can't seem to even find any identical seats covers on the internet.. or did I just not search long enough? Also, I was wondering, if the Gran Coupe came with painted (metal) bumpers, or if someone painted them along the way? It came to Holland in around 2012, painted red (originally gold), and seems to have had a respray (good quality) there, in a slightly brighter red. Now, I don't particularly like red cars (or painted bumpers for thet matter).. but I have to admit, that it's starting to grow on me. Anyways, I hope you will enjoy checking out the Barracuda. Unfortunately, I bought it VERY late in the season, so I don't have a lot of pictures yet... actually just from when we went to look at it, and a few more the pick up, the evening it arrived in my driveway, and the next (frozen) morning. Merry "E-Mas" everybody, and a "Happy E-Year"
I found that the P5X9 are the Black and White houndstooth material with vinyl borders and the red inserts are on the outer ridge of the seat. I think they were replaced and had the red insert sewn into the inner ridge. the only other color is Black and Burnt Orange with Bright orange inserts. Also your car with the 383 with 2 bbl auto is one of 945 made and the bumpers were painted not coated like they were. The material that is in the seats may be real hard or impossible. But who ever did them had the buttons where they are met to be and the insert color is correct but in the wrong location. the other seat pattern # was P5X4. Nice looking car and the under side is almost spotless how did they keep it so clean. I missed your reply Friday and the "alert", and actually just posted my latest "seat-findings" in the interior forum, as I pulled the covers from the seats today.. They may still be "not original", but if so.. MAN, the upholstery guy did a good job hiding the evidence! I didn't see a SINGLE hole from any previous stitching anywhere, and I really looked for them! The underside must have been either bead blasted, or cleaned some other very efficient way, and then painted red. Not to happy about the paint, but it does show the great condition, which of course made me super happy. It's ALMOST spotless, and I stuck my finger inside the rails, and they are as clean on the inside, as they are on the outside. I was ALL smiles, while inspecting the underside! Thanks for your return, I've been working on my Cuda I just got it all apart again and having it repainted. I am working with my painter and we are block sanding down the single stage Lacquer put on in 94 when I did the body work . I'll post pic in my garage as I progress working to have it painted in two to three weeks. Good luck with your seats and hood. You're right, timing is everything but sometimes one has to buy a rare car in good shape when THEY come up for sale. Nice ride! The J54 sport hood was a "raisin bran" two scoop "cuda style" hood. Thnx man.. Yet another thing to rectify..! I don't dare to speculate about how somebody managed to loose a dual scoop hood, not to mention subsequently replacing it with a flat one! About the seat fabric.. I went out, and took a good look, and stitches still look VERY original to me! I didn't see any row of "old needle holes" anywhere along the edge if the seam, so either some upholstry-guy had me fooled again, or... could there be a chance, that these are original? I checked the fender tag, which just says "5 = Cloth and Vinyl Bucket Seats". Also noticed, that the hood code is "J54 Sports hood 70-1".. but mine is flat. Anyone knows which hood this is..? When I Google the J54 option, I get MORE shaker hoods, then I get the "Dual Scoop" hood. Also, I found a Cuda, which apparently has BOTH the J54 and N96 codes.. LINK - But does anyone know what hood mine came with, from the fender tag information below. Also seems, that "L34" (Fog lights? ), is now gone missing in action.. I think Dante's has the seat covers you are looking for? Very nice, what's happening with the ralley wheel centre caps? in the first photo it has the correct ones and all the other photos it has 72-74 style centre caps. Chryslerdude and paharamia like this. When I bought my 68' Charger, it came with "American Racing Outlaw's", but I ordered a set of the 17" inch "Ralley alu-repros" for it with Ralley centers. When they arrived, I thought it looked wrong with them particular centers, on that particular car.. sort of "to new", for a 68' car , (which is kind of silly, as the alloy wheels should do so too), but either way, I never put them on, and I think these are identical with the original ones? If not, I also have set of original steel ralley wheels (with Ralley centers.. three original US made , and one that says "made in China :-D ). These were on my very first US car, 69' 300 vert, which I bought it in 2003. I didn't like the Ralleys much on the C-Body, so got a set of Hurst 300 wheels for it instead. In either case, this issue will be rectified... when summer comes! Preferably with the "ORIGINAL TO THE CAR wheels", if I can track them down..
BTW: HAPPY NEW YEAR !! Specific to the bumpers, the factory never painted direct to metal bumpers. They were coated in "elastomeric" rubber, then painted. The front only bumper would have been coded A21. Back and front A22. That is one nice Gran Coupe. I like the fact they've left the body side protection mouldings alone, my car is supposed to have them but they are missing and I have never seen original or reproduction ones for sale they must be one of the rarest parts to find if you need them.